These are the first fruits to appear on this loquat tree. It's likely 6 years old, though I planted it 2 years ago. We had a late frost this year that would have taken all the fruit off this tree... except for the fact that I had a secret weapon! That is a drum filled with liquid plutonium. No. It's not. It's just water. The thermal mass of that water, along with a few thrift store sheets and blankets made a big difference. I'm not sure if you can see it in this photo, but the only place on the entire loquat tree that held fruit was the portion right around the barrel of water. 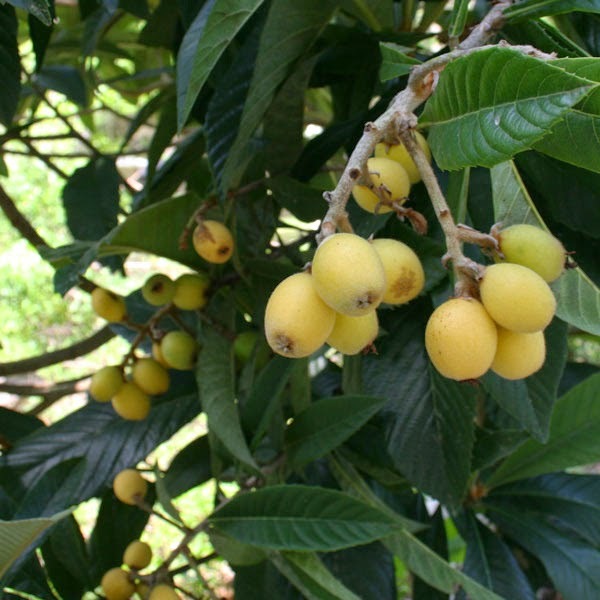 Loquat fruit are only cold-hardy down to 25 degrees, though the rest of the tree can easily handle the teens. 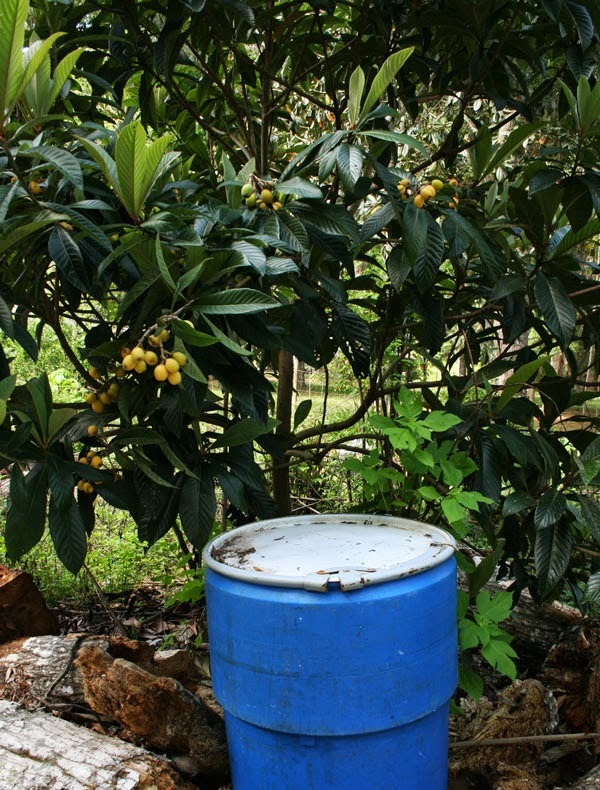 Because I HAD to know what the fruit on this tree tasted like, I covered that one corner of the tree, plus added the barrel - and it worked like a charm. Water holds a lot of energy. You can use this trick to protect young citrus and other tender plants as well. 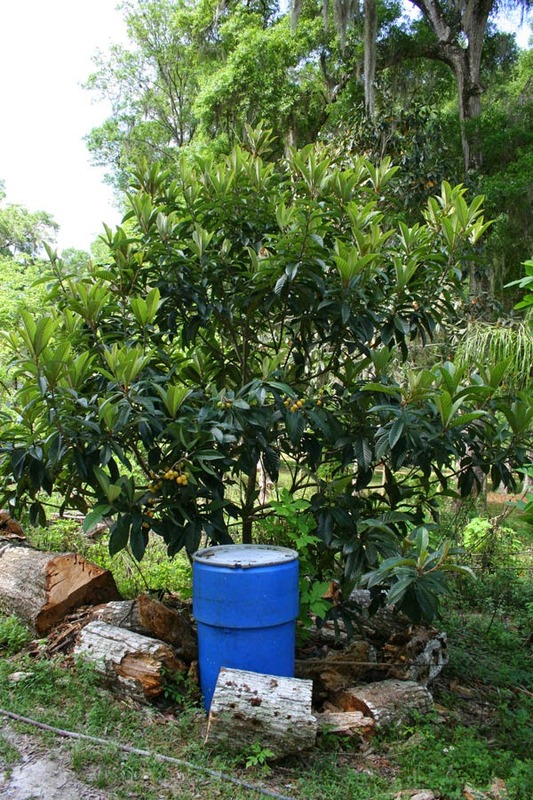 Just tuck a barrel right next to the trunk and cover the plant with a blanket or sheet to keep the heat of the water in. Unfortunately, the loquats are really lemony-tart and sour (which has nothing to do with the cold weather). Not all loquat trees are created equal, which is why I wanted to see what this seedling tree would bear. Now I know it needs to be grafted with scions from an improved cultivar. It'll take some work, but will greatly improve the fruit. I've waited 4 years for fruit - why not graft and wait one more? For now, I'll just pretend it's a cold-hardy lemon. Our two loquat trees are 5 years old and we are still waiting for them to bear fruit. Of course, now that we are moving to a new location, the trees no doubt will start blossoming. Another water thermal mass success story. I grow banana plants near my pool instead of the standard robellini. The leaves hanging directly over the pool all the way back to the leaves within 2' of the pool were undamaged. The ones farther away from the pool were fried. I live in Orlando so we only had 2 freezing nights this year. The banana fruit survived just fine! At least my pool is useful for something in the winter time!